Radio amateurs are taking part in the response to the 6.2 magnitude earthquake on August 24 in central Italy, International Amateur Radio Union Region 1 (IARU-R1) President Don Beattie, G3BJ, reports. IARU Region 1 Emergency Communications Coordinator Greg Mossop, G0DUB, has requested that 7060 kHz (LSB ±10 kHz) be kept clear of non-emergency traffic, as well as any other center- of-activity (COA) frequencies that may be in use for emergency communication within Italy. (On 80 meters, the COA frequency is 3760 kHz). Other frequencies reported to be active include 7045, 3643, and 3580 kHz (PSK). The earthquake claimed some 240 lives, although rescue operations are still under way. According to the IARU Region 1 website, Italian radio amateurs are active in the emergency response, and no outside assistance has been requested at this time. According to Beattie, the Italian Amateur Radio volunteers are "following their planned response with their government" and that any requests for information on missing persons should be made via the Red Cross or other recognized relief organizations. The worst loss of life was in the town of Amatrice, where more than 180 people died. Tremors in the aftermath of the initial quake were felt as far away as Rome. Survivors are staying in tents or otherwise out of doors. A reported 4300 people were said to be active in rescue operations in the region. 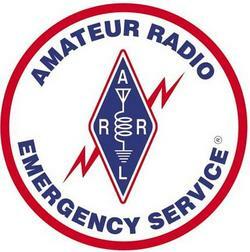 Amateur Radio Emergency Service (ARES) volunteers responding to the Louisiana flood emergency stood down on August 20. Assistant Section Manager Matt Anderson, KD5KNZ, reported over the weekend that Louisiana ARES was in the process of deactivating from the recent flood response, and that there was no longer a need for additional volunteers. Anderson served as the Incident Point of Contact in Baton Rouge. "Several amateurs will remain on site, reporting directly to the Red Cross as they begin to transfer to recovery operations," Anderson said. "We greatly appreciate all the assistance from ARRL HQ and the many Sections who provided support to the operation." ARES volunteers in Louisiana deactivated after 6 days of operations in response to the flooding catastrophe, which also affected parts of Mississippi. ARES provided communication support to the Red Cross in five Louisiana parishes following the record flooding. At the height of the crisis, several shelters and Red Cross chapter offices were operating at full capacity, although the shelter population has diminished considerably. Amateur Radio volunteers from Alabama, Arkansas, and Mississippi volunteered to serve at multiple Red Cross chapters and shelters throughout the affected area. With local and parish resources stretched to the limit, ham radio volunteers served as the communication link between Red Cross shelters and command centers, relaying information on the needs at each shelter back to Red Cross offices. Read more. DX Engineering Chief Operating Officer Tim Duffy, K3LR, says he's enthusiastic about the new Dayton Hamvention® venue at the Greene County Fairgrounds in Xenia, Ohio -- both as a vendor and as an individual radio amateur. DX Engineering recently produced a short video tour of the new Hamvention location, which includes an interview with Hamvention spokesperson Mike Kalter, W8CI. "I can tell you that I have been hearing from all over the world a sigh of relief after [people] see the video we did at the Fairgrounds," Duffy told ARRL. "The new venue is huge, and it is clean -- it will be perfect for Hamvention." Duffy said he likes the Greene County Fairgrounds so much that he thinks that Hamvention will be even better at its new site than it had been for the past 10 years or so at Hara Arena in Trotwood, Ohio. Duffy, who is also ARRL Western Pennsylvania Section Manager, encouraged the Amateur Radio community to support and encourage Hamvention's sponsor -- the Dayton Amateur Radio Association (DARA) as it makes the myriad arrangements for the big show. "This is a very tough job for an all-volunteer staff," he added. In the approximately 8-minute video, Kalter, who is DARA's treasurer, said he was happy that Duffy, as a Hamvention vendor, could see the new venue firsthand. "We consider this a collaboration," Kalter told Duffy. "We want everybody to be happy." For his part, Duffy was enthusiastic about the size of the new site. "This place is so big!" he said. The Fairgrounds covers more than 100 acres, and Duffy said he checked out every building. He told Kalter that he was impressed to see DARA volunteers showing up at the new Hamvention site every day as they prepare for their Xenia debut in 2017. "What I saw here today -- I think you're well on your way," Duffy told Kalter. "Things are on the right track." Kalter expressed the hope that DARA will be able to take Hamvention to "a whole new level" at its new location. ARRL members in the Rocky Mountain and Southeastern Divisions will choose between incumbents and challengers in balloting for Division leadership positions this fall. In the Rocky Mountain and Southeastern Divisions, contests exist for the Director's seat. In the Southwestern Division, the incumbent Vice Director is not seeking another term, and no other candidates came forward, setting the stage for a separate nomination and election process. Other candidates for the 2017-2019 term in the affected Divisions are running unopposed. All candidates have been found to be eligible by the Ethics and Elections Committee to run for office. In the Rocky Mountain Division, incumbent Director Dwayne Allen, WY7FD, faces a challenge from Garth Crowe, WY7GC (ex-N7XKT). Allen has served as Rocky Mountain Division Director since January. As Vice Director, he succeeded Director Brian Mileshosky, N5ZGT, who was elected ARRL Second Vice President at the January ARRL Board meeting. Allen was Wyoming Section Manager from 2005 until 2007. Crowe served as Wyoming SM from 2009 until 2015, and he is now an Assistant SM and an Emergency Coordinator. In the Southeastern Division, former Director Greg Sarratt, W4OZK, will attempt to regain that position from sitting Director Doug Rehman, K4AC. Sarratt served as Southeastern Division Director from 2008 until 2013 and is a past Alabama Section Manager. The sole candidate for the Southeastern Division Vice Director's slot is Joseph Tiritilli, N4ZUW, of Deerfield Beach, Florida, who has been declared elected. Tiritilli has served as an Official Observer and Official Emergency Station since November 2009. He's also a Volunteer Examiner and an ARRL Registered Instructor. In the Southwestern Division, sitting Vice Director Martin Woll, N6VI, has decided not to run for another term, after serving since 2008. He has been a member of the Board's Amateur Radio Legal Defense, and Assistance and Legislative Advocacy committees. Since there were no other candidates for the Vice Director's seat, nominees for Southwestern Division Vice Director will be resolicited and voted upon in a separate election, to be announced. In Divisions where there is a contested race, all ARRL members living in the Division and in good standing as of September 10, 2016, will have the opportunity to vote. 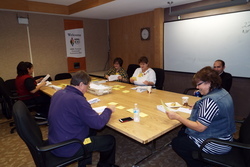 While electronic voting has been available in the past, the League now has returned to using only paper ballots. Ballots and candidates' statements will go out to members eligible to vote in the Rocky Mountain and Southeastern Divisions no later than October 1, 2016. Completed ballots are due back at ARRL Headquarters by noon Eastern Time on Friday, November 18, 2016; they will be counted on that day, and the results announced as soon as all are available. Pacific Division Director Robert Vallio, W6RGG, and Vice Director James Tiemstra, K6JAT; Rocky Mountain Division Vice Director Jeff Ryan, K0RM; Southwestern Division Director Richard Norton, N6AA, and West Gulf Division Director Dr David Woolweaver, K5RAV, and Vice Director John Stratton, N5AUS. Two incumbent Section Managers were declared re-elected in balloted elections that concluded on August 23, when ballots were counted at ARRL Headquarters. In Minnesota, incumbent SM Skip Jackson, KS0J, of Inver Grove Heights, Minnesota, received 452 votes to 396 for challenger Ann Foster, K0ANN, of St Anthony. Jackson has served as Minnesota Section Manager since 2004. In Ohio, Scott Yonally, N8SY, earned a new term as SM, outpolling Matt Welch, W8DEC, of Windsor, 1392 to 483. Yonally, of Mansfield, has been Ohio's SM since 2014. After 25 years, Connecticut will be getting a new Section Manager. Charles Motes Jr, K1DFS, of Plainville, will take the reins from Betsey Doane, K1EIC, of Shelton. Doane decided not to run for another term of office after leading the Connecticut Section since 1991. Motes has served as Connecticut's Official Observer Coordinator since 2008. He's also been an Emergency Coordinator. Oscar Resto, KP4RF, will become Puerto Rico's new SM this fall. Resto, from Vega Alta, was the only nominee to replace incumbent SM Rene Fonseca, NP3O, who decided not to seek a new term after serving since 2012. In Oklahoma, Kevin O'Dell, N0IRW, returns as the leader of the Oklahoma Field Organization this fall. He was the sole nominee. The sitting SM, Lloyd Colston, KC5FM, of Altus, decided not to run for a new term. O'Dell served previously as Oklahoma SM, from 2010 to 2014. These incumbent Section Managers were unopposed during the nomination period and were declared elected: Laura Mueller, N2LJM (Western New York); Jeff Beals, WA4AW (Southern Florida); Fred Kleber, K9VV (Virgin Islands); Lynn Nelson, W0ND (North Dakota), and Ed Stuckey, AI7H (Idaho). New terms for all successful candidates will begin on October 1. "Software Defined Radio" is the topic of the new (August 25) episode of the "ARRL The Doctor is In" podcast. Listen...and learn! Happy 100th Anniversary to the National Park Service! President Woodrow Wilson created the NPS on August 25, 1916, as a new bureau within the Department of the Interior. 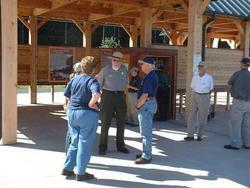 Today, NPS oversees many parks and monuments of cultural or historical significance. This celebration is the reason for the ARRL National Parks on the Air program. NPS celebrated in grand style. On August 24, President Barack Obama created the Katahdin Woods and Waters National Monument in northern Maine. It is the 413th official National Park Service unit, and NPOTA Chasers and Activators will know it as MN84. Who will be the first NPOTA Activator to hand out this new one? Hams across the country are activating more than 80 units during the NPS Centennial week, including Hawaii Volcanoes National Park in Hawaii, and Pecos National Historical Park in New Mexico. Get on the air and help the National Park Service celebrate! Lewis and Clark National Historical Park in Astoria, Oregon, will partner with the Mouth of the Columbia Amateur Radio Club to provide park visitors with an opportunity to see Amateur Radio up close over the Labor Day weekend. As part of the ARRL National Parks on the Air (NPOTA) program, club members will set up a station at the park's Netul Landing. The KF7TCG special event is set to start on the evening of Friday, September 2, and continue through the afternoon of Sunday, September 4. As a special highlight, an Amateur Radio on the International Space Station (ARISS) contact has been set for Saturday, September 3, at 1821 UTC. "This is an amazing cooperative effort between ARRL, the National Park Service, and the ARISS team," said ARRL Media and Public Relations Manager Sean Kutzko, KX9X -- who is also co-coordinator of the NPOTA program. "Using the science and skill of Amateur Radio to bring astronauts into a National Park Service unit devoted to the greatest scientific expedition in the history of the US highlights how much all three organizations have in common. We are all dedicated to public service, and exploration and education of the natural resources in and around our world. We are proud to use our skills and expertise to bring 21st century explorers to National Park visitors." When the power went out on June 4 at both the Huntington Gardens and Five Points senior residences in Huntington Beach, California, Huntington Beach RACES (HBRACES) and Community Emergency Response Team (CERT) volunteers promptly activated to help. Each residential structure stands 14 stories tall. At Huntington Gardens, a generator supplied power to the hallways and elevators, but not to individual living units or telephones; residents had no way of calling 911 if an emergency occurred. Five Points, with no back-up generator, was left in complete darkness. RACES Radio Officer Dr Steve Graboff, W6GOS, and his assistant, Steve Albert, KE6OCE, started a 2 meter net and logged in available communicators. Operators checked into the net were advised to proceed to the staging at Huntington Beach City Hall. "[T]he response to the call to activation by HBRACES was impressive," Graboff said. "The professional communications skills displayed by the operators were outstanding. The quality of HBRACES training was clearly evident in all of our responders, including those deployed in the field and others who were assigned to the incident command post." HBRACES communicators paired with a Huntington Beach CERT responder, and each team was assigned to a floor of the two facilities to cover communication and emergency calls. 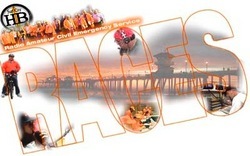 This marked the first time Huntington Beach RACES and CERT members were deployed in pairs. The volunteers patrolled the floors of the buildings in the dark, looking and listening for people in need of help, or for anyone who might take advantage of the situation. Residents thus had direct communication with the Huntington Beach Fire and Police departments. Graboff said that having both organizations working together created a safer environment for the volunteers, since they were not alone. The Red Cross dispatched a canteen vehicle to support the volunteers with snacks and coffee. The US Department of Justice announced this week that three companies have agreed to plead guilty for their roles in a conspiracy to fix prices for electrolytic capacitors sold to customers in the US and elsewhere. The companies are Rubycon Corporation, Elna Co Ltd, and Holy Stone Holdings Co Ltd.
"The Antitrust Division has now charged five companies and one individual for their participation in this international price-fixing conspiracy," Deputy Assistant Attorney General Brent Snyder of the Justice Department's Antitrust Division, said in an August 23 Justice Department news release. "The electrolytic capacitors conspiracy affected millions of American consumers who use electronic devices containing capacitors every day." The division filed one-count felony charges against each of the three companies in US District Court in San Francisco. In addition to pleading guilty to the charges against them, each company has agreed to pay a criminal fine and to cooperate with the Division's ongoing investigation. The plea agreements are subject to court approval. NEC TOKIN Corp and Hitachi Chemical Co Ltd already pleaded guilty earlier to participating in the same worldwide conspiracy. Read more. An ARRL Radiogram sent via Amateur Radio to Queen Elizabeth II on August 16 commemorated the anniversary of an exchange of telegrams 158 years earlier between Queen Victoria and US President James Buchanan. In August 1858, President Buchanan -- staying at his summer White House in Bedford Springs, Pennsylvania -- responded to a transatlantic telegraph invitation from Queen Victoria at Buckingham Palace. "Come, let us talk together," the Queen's message began in 1858. The 21st Century contact, between Bedford County Amateur Radio Society (BCARS) special event N3B at Omni Bedford Springs Resort and GB3RS at the RSGB National Radio Centre Bletchley Park, was an effort to recreate the 19th Century event. ARRL helped to broker the arrangement with RSGB to activate GB3RS and make the contact possible. "Greetings from Bedford County Penna. on the 158th anniversary of the first transatlantic telegraph message between Queen Victoria and President Buchanan in 1858," the Radiogram said. "The county commissioners wish her majesty and Prince Philip best wishes." It was signed by Bedford County Commission Chair Josh Lang. The message to the UK was transmitted via CW on 20 meters by Lloyd B. Roach, K3QNT, and Bernie Frank, W3DRW, from the BCARS communication van. "Signals were marginal, but the message got through," Roach said. "Our HF antenna on the van wasn't working too well," he added. "However, we were able to hear each other." 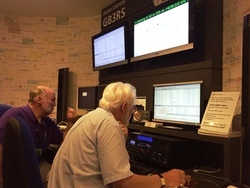 The operator at GB3RS was Trevor Hughes, G4WKJ, with Andy Roberts, M0GYK, assisting. Roach said the N3B special event station was a huge hit at the resort. "Guests from the hotel visited the van and observed our operations," he told ARRL. 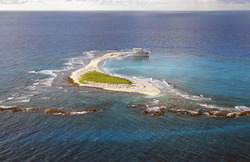 "This is a world-renowned destination. Eleven Presidents have used the facility for their summer White House, including Jimmy Carter, Ronald Reagan, and George W. Bush." RSGB General Manager Steve Thomas, M1ACB, indicated that the Radiogram had been forwarded to the Queen at Buckingham Palace. The special event received wide media coverage from a local newspaper and two TV stations. 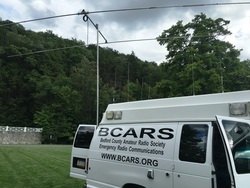 Participants at the Bedford Springs end, in addition to Frank and Roach, included Steve Elliott, KA3UDR; Jay Williams, K3SCM; John Hogenmiller, KB3DFZ; Mark Leibfreid, KC3CMF; Gary Metivier, KC3HKZ; Kenny Burtnett, WB3JEK, and Robin Hogenmiller, KC3EXR. ARRL Southeastern Division Vice Director Mike Lee, AA6ML, Resigns: ARRL Southeastern Division Vice Director Mike Lee, AA6ML, of Palm Coast, Florida, has resigned from office. Lee was appointed in 2014 to fill a vacancy created by a resignation. He served previously as Northern Florida Section Emergency Coordinator. "I regret Mike's decision to resign as Vice Director," said ARRL CEO, Tom Gallagher, NY2RF. "Mike made a significant contribution to the League's efforts in emergency communications, as well as serving on several important committees over the years. We all wish him well, and we will miss him." Tad Cook, K7RA, Seattle, reports: Solar activity over the August 18-24 reporting period was down, compared to the previous week, with the average daily sunspot number declining from 73.9 to 33.9, and average daily solar flux from 89.2 to 79.6. The average planetary A index increased from 6.9 to 9.7, while the mid-latitude number rose from 7.4 to 8.7. Expected solar flux is 80 on August 25-26; 75 on August 27-September 1; 80 and 85 on September 2-3; 90 on September 4-10; 88 on September 11-12; 85 on September 13; 80 on September 14-15; then 78 and 75 on September 16-17; 80 on September 18-20; 84 on September 21-22; 82, 80, and 78 on September 23-25; 75 on September 26-28; 80 and 85 on September 29-30, and 90 on October 1-7. Predicted planetary A index is 10 and 6 on August 25-26; 5 on August 27-28; 14, 20, 12, 10, and 15 on August 29-September 2; 12 on September 3-4; 15 on September 5-6; 8 and 10 on September 7-8; 5 on September 9-12; 10 and 8 on September 13-14; 5 on September 15-16; 8, 7, 8, 12, and 8 on September 17-21; 5 on September 22-24; 15, 25, and 18 on September 25-27; 15 on September 28-29; 12 on September 30-October 1, and 15 on October 2-3. NOAA released an interesting bulletin regarding a new site for watching Total Electron Content (TEC) of the ionosphere. TEC is the total number of electrons present along a path between a radio transmitter and a receiver. 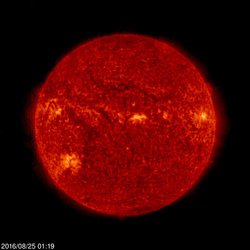 The Space Weather Prediction Center (SWPC) has deployed an updated and expanded version of its US Total Electron Content (US-TEC) model. Sunspot numbers for August 18 through 24 were 54, 37, 12, 11, 33, 47, and 43, with a mean of 33.9. The 10.7 centimeter flux was 82.4, 80.8, 78.1, 76.7, 80, 81.3, and 78, with a mean of 79.6. Estimated planetary A indices were 7, 5, 4, 10, 5, 18, and 19, with a mean of 9.7. Estimated mid-latitude A indices were 8, 5, 4, 9, 6, 12, and 17, with a mean of 8.7.